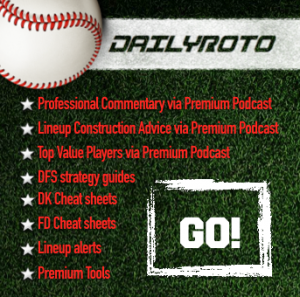 DailyRoto’s MLB Solo Shot Host, Logan Hitchcock, gets you headed in the right direction with his 4/12 MLB DFS Picks. Check out where his mind is at today when it comes to roster construction at FanDuel and DraftKings. Narrowing our focus should be no issue today since there is a game being played at Coors Field. The Giants travel to Coors and right-handers Jeff Samardzija and Tyler Chatwood will square off in what should be the top priority for hitter selection on this slate. With a total of 11, you’ll need to have exposure to the Giants and Rockies bats in cash games and should have an eye on them in tournaments as well. Neither Chatwood or Samardzija has had much success against left-handed batters, so my preferred options are the hitters near the top of each order with the platoon advantage. This puts Denard Span, Joe Panik and Brandon Belt firmly on my radar for San Francisco and Charlie Blackmon, Carlos Gonzalez and Gerrardo Parra in my sights for Colorado. But wait?! I’m also loading up exposure to right-handers as well, as neither one of these pitchers possesses a wide enough split to righties for me to avoid the elite run scoring environment. Also put Buster Posey, Hunter Pence, Trevor Story, Nolan Arenado and any others near the top of these lineups in play for every format. The other great part about Coors Field is that it inflates the value attributed to punt players. In the outfield or at catcher, any options that make their way into the lineups tonight (maybe Tony Wolters or Nick Hundley) are also in play as cheap ways to get exposure to the best offensive game on the slate. Using these players will help alleviate the pains of trying to pay up for pitching. If you’re trying to find a few higher priced options outside of Coors Field to help fill in your tournament stack, shift your eyes to David Ortiz, Nelson Cruz or Bryce Harper. The trio all will hold the platoon advantage tonight and all possess elite skills against the opposite handedness. Harper has garnered absurd ownerships against right-handers this early in the season, and while he remains the top option of the three, if looking for a more contrarian option you can slide down to Nelson Cruz or Ortiz. Cruz does not have a great ballpark in his favor as Seattle suppresses power, but he does get left-hander Derek Holland in what remains an excellent matchup given his .245 ISO and .389 wOBA against southpaws in his career. Ortiz will be the lowest owned of the bunch, but will be my favorite way to attack tournaments if trying to be contrarian. His opponent, Mike Wright is a flyball pitcher and although Fenway is better for right-handed power, Big Papi has not had much trouble in his career there. He has amassed a .305 ISO and .420 wOBA (ELITE) in his career against right-handers and should have no trouble with Wright tonight. Need a few value players that are not in Coors Field tonight? How about Colby Rasmus? Rasmus is still underpriced around the industry and hits in a premier lineup spot (4th) in a powerful offense. Rasmus will have the platoon advantage on Kris Medlen tonight and although Medlen is an above average groundball pitcher, I’m not moving off Rasmus. Last year, Medlen’s strikeout rate was low to lefties, his walk rate was high, his flyball rate was higher for left-handers and lefties put together over a 35% hard-hit rate against him. Rasmus is a great cash game filler and tournament option. If you need some help in the middle of the infield take a look at Cesar Hernandez and Cory Spangenberg. Both Hernandez and Spangenberg will hit second for their respective offensives and have tons of stolen base upside to mask a lack of power for the pair. Both have accessible price tags and are face weak pitchers in Robbie Erlin and Charlie Morton. Despite inconsistencies from even the best pitchers to start the season we unfortunately have to narrow down our choices today and roster one or two. I’m not sure if this is the format I will always stick to, but I’m going to rank five pitchers from top to bottom in terms of my willingness to roster them in cash games. Remember, paying for pitching is key! Pitcher performances are a more predictable and they carry a safer baseline. Also keep in mind, strikeouts are one of the most heavily correlated statistics in baseball and one of the easiest things that we can project. You want to pay for strikeouts! Noah Syndergaard and Jose Fernandez square off in what should be the best game from a pure baseball perspective tonight. The game has the lowest total on the slate (6) and features two of the premier young right-handers in the game. Both of these guys have tons of strikeout upside, but I’m leaning Syndergaard as he’s the favorite and faces an overall weaker lineup in the Miami Marlins. Fernandez is a bit more expensive, but is also in play given his strikeout upside. It’s a bit of a negative park shift for Fernandez, but that isn’t something I’m concerned with tonight. Due to his price, I’m leaning against using him in cash games, in favor of Syndergaard so I can still grab Coors Field exposure, but I’m perfectly fine with using him should you find the salary. Kluber also has an awesome matchup tonight moving to Tropicana Field to take on the Tampa Bay Rays. This Rays lineup should be no match for Kluber, who also possesses a ton of strikouet upside and fairly safe floor as well. The Trop suppresses power from both sides of the plate and is a great place for Kluber to pitch tonight. He falls third because of his price, but is firmly in play in all formats. If looking for a bit of salary relief, I’m focusing on Gio Gonzalez and Hector Santiago. Neither one of these lefties is in a great spot for strikeout potential, but there aren’t any other pitchers I’d want to trust on this slate. Gio has a matchup with a weak Braves lineup and he’ll be neutralizing the Braves best hitter, Freddie Freeman. Gonzalez is a sizable favorite and given the Braves implied run total of only 3.1 runs, I’m on him as a secondary pitcher in cash. Santiago is even cheaper than Gonzalez and while he’s a dog on the road, I’m not threatened by the Oakland Athletics. Santiago has been tough on left-handers in his career and despite being a flyball pitcher, pitching in the Coliseum will mitigate the risk that comes with using him a tad. You won’t need much from him in order for him to pay off his price tag, as using him allows you to use a top pitcher and Coors Field. He’s the last guy I’d feel safe using in cash, but understand that he does have more risk than the others given his skillset.